The veg and herbs grown by Incredible Edible Aireborough in Parkinson’s Park, with the help of children from Guiseley Infants School, will be used in a harvest feast with a difference at Guiseley Farmers’ Market on Sunday 20th September, when IE Aireborough and Guiseley in Bloom join forces to cook up a celebratory foodie feast of their community garden vegetables, herbs and fruit – between 11am and 2pm. Along with the food, they’ll be discussing how to cook interesting dishes with stall visitors. 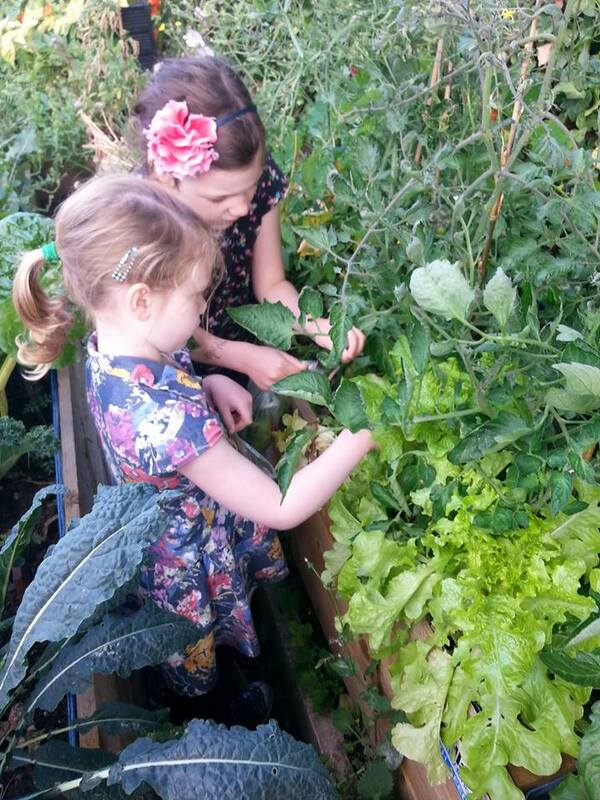 IE Aireborough grow vegetables and herbs in their community gardens at the Station Pub, Parkinson’s Park and Otley Road. The produce is free to anyone to come and pick, take home and cook up a delicious meal – garden to plate in less than a day. Guiseley in Bloom, grow fruit and vegetables at Springfield Park – which is also free to pick – and provided the planter in Parkinson’s Park. Parkinson’s Park also has a number of fruit trees planted over the years, and a new community orchard planted in the spring. There will be a small charge for the Harvest Feast on Sunday, as the IE Aireborough are fund raising to expand their community food growing potential, to make more available next year. Dedicated meat eaters, may be pleased to know they can join in, as the Market will also have the Flying Pig and their pulled pork to garnish the veg feast. IE Aireborough was set up in Spring this year by Becky Mears and a team of volunteers. They have worked hard every Farmers’ Market to help people plant and harvest the produce: teaching children the fun or gardening and where food comes from has been high on their list of aims. The group were inspired by the original IE Todmorden at the Aireborough Neighbourhood Forum’s Aireborough Festival in February. The whole event is also a celebration of ‘community entrepreneurs’ – from the Friends of Parkinson’s Park, to The Station Pub, who support a number of community groups including the Friends, as well as running the Farmers Market and their Music Festival, to IE Aireborough, and Guiseley in Bloom, who do such a fantastic job at keeping the township beautiful.